Of course, people in private enterprise would discount any commentary on the ECB that covers financial and economic parameters but not the political drivers in question. 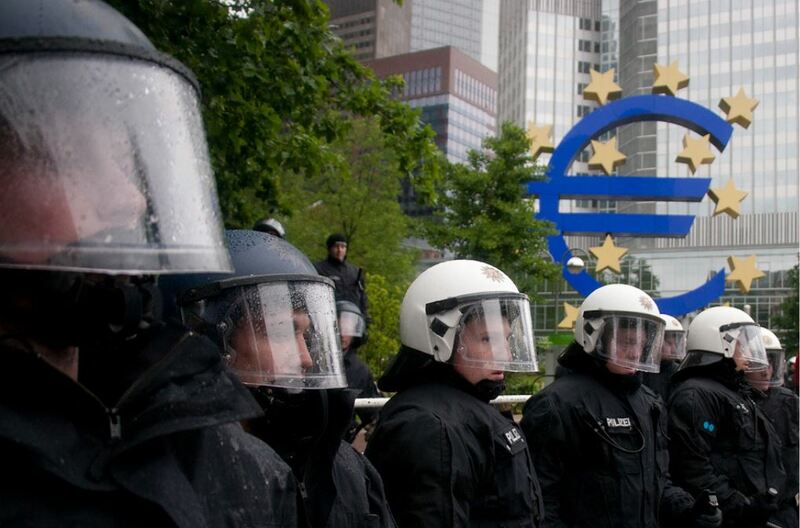 Political insiders and, generally, people who can see what is going on, has been going on for decades, know that the ECB is a political tool with a political mission. There are several concurrent aims, some of which will work if the highest priority of enforced federalisation does not work out as planned. There are, as ever, motives at work which are not acknowledged and, if alluded to in a public forum, simply ignored. This is a known fact in financial and commercial dealings, as in politics it is the norm; don’t just take note of what they say, but see what they are doing, etc. The ECB doesn’t mind if there is no economic growth. It is not even aiming for growth. 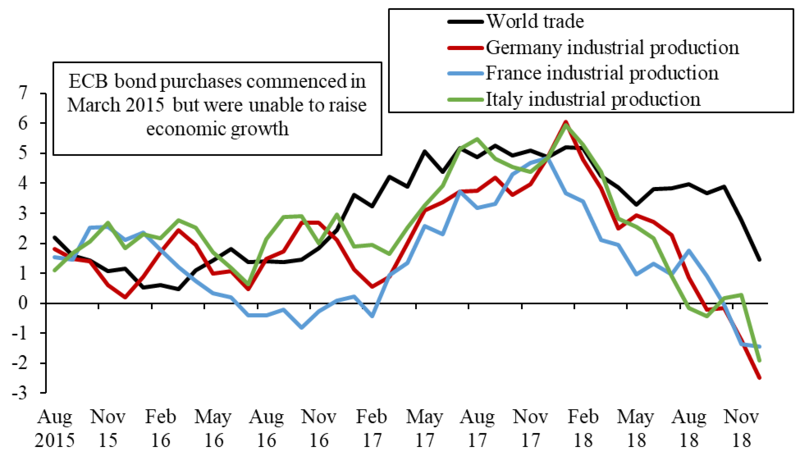 It’s obvious motives are to help the federalisation project along and prevent deflation until such time as a Eurozone crisis can be turned to advantage. Some ulterior motives, looking at the ways of the western world at the moment, would be to whip up money supply in any way so as to be able to cream off the most of total EU economic activity without the system breaking down bedore it suits the EU elite, i.e., before the EU elite sees a chance to turn a full-blown crisis to its advantage. In that regard, a mercenary EU army should be up and running before the system or the EU peoples’ patience break down. Concurrently, the slow and steady economic impoverishment of all people in EU member states is part of the program to disenfranchise that part of the EU electorates not fully on board with the EU federalisation project. The more that people depend on an income from work or benefit from week to week, without any reserves to call upon, the more they are disenfranchised and helpless in the face of the despotism the EU leadership may consider necessary to move the project on. The EU is using various methods, but steamrollering when all else fails is fully part of the armoury, as we have seen already. Democracy is already shown to be a sham, unless one factors in that it is a no holds barred sport. Anything and everything is allowed in politics. No field of human endeavour or activity, even just feeling and thinking, is outside the ring where political contention takes place. The incumbents, they who have hijacked parliamentary democracy, have the advantage, because they make the rules, interpret the rules, wave the rules as and when convenient to them, all the while holding the electorates to account as far as law and order is concerned. It is clever as long as there is any residual trust in the faces put forward to fool the people and any residual faith left in the system. Once trust and faith are dissipated, fear and the threat of state-initiated violence against dissenters take over as tools of state to maintain control. By that time martial law will be the norm, as any kind of violence on the part of protesters will be the perfect excuse for the ‘authorities’ to crack down. Globalisation is not a kindergarten game. Politics is serious play, as people in Europe are starting to find out. The moneys sluiced away from nation-states’ economies by all means available to the international high finance operators can be used to buy more financial and economic assets in these countries, thus building into these nation-states yet greater political control. When things blow up before the EU leadership is ready, things could get sticky, but no doubt they have contingency plans-they brook no opposition.